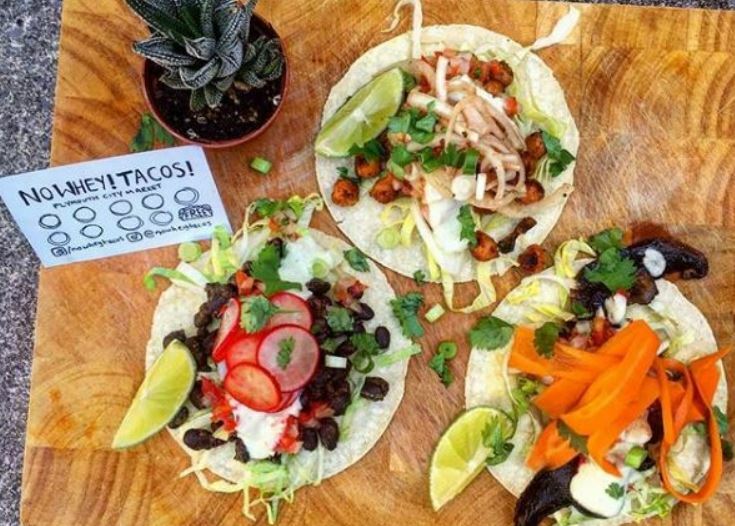 To coincide with the recent West End Carnival, vegan champions No Whey Tacos! opened their new stall, serving up super tasty, super wholesome Mexican Street foods, totally plant-based and totally delicious! With ingredients including BBQ pulled jackfruit, tamari mushrooms, chipotle refried beans, homemade spicy sauces and all sorts of raw and crunchy veg, No Whey Tacos! has certainly changed people’s minds about just how delicious and varied a vegan diet can be. Long-time vegans Fiona and her partner Joe originally set up No Whey Tacos! as an alternative pop up food bar for the festival circuit. They popped up at a number of local events and were such a hit it became clear to them both that there really was a demand for healthy vegan food locally that wasn’t being filled. The Market seemed like a great place to start up, as there were no huge refit or set up costs, and it already has a good reputation as a place to eat, with healthy competition from the other existing food stalls. Fiona says:” We feel it’s really important to support your local community. By being part of Plymouth Market, we’re bringing something to a part of Plymouth that could really benefit from it. Starting an enterprise in Plymouth Market is a great way to see if your business plan works without all the expense and stress associated with renting or buying a shop. The options offer great flexibility and stalls/ benches can be rented on a day or weekly basis, giving you the perfect opportunity to test the water and perhaps adjust your offering before spending too much capital. Call the Market team on 01752 306551 if you would like to discuss your ideas for a new stall in Plymouth Market.